Take a tour of the Mexican capital's burgeoning burger scene, which is finally providing a reason to take a break from the tacos. When Mexico City’s steady parade of tacos, tortas, tamales, tostadas, and tlacoyos (what the denizens wryly call the “Vitamin T” diet) is so exceptional, why waste time and stomach space eating burgers? It’s a fair question, especially considering that the city’s traditional street-food scene is incomparable, and its alta cuisine (i.e., fine-dining at establishments like Pujol and Quintonil) is among the world’s most exciting. But in the past five years, a burger bomb has detonated, flinging char-broiled patties, homemade buns, and condiments galore to every corner of D.F. From the DIY corner stands constructed after midnight to retro diners inspired by American Graffiti, the hamburgesas of DF make a great city even better. Here’s a guide to local burger landscape. You can’t walk three blocks in Mexico City without encountering a puesto de hamburgesas. These street operations are essentially 5’ x 8’ metal shacks outfit with high-octane griddles, with the sole purpose of selling as many cheap hamburgers (25-45 pesos/$2-4 each) to pedestrians as possible, usually within a six-hour window. They usually populate the streets during the days and evenings, giving way to quesadilla ladies who take over for the late-night shift. The cooks that work these rapid-fire lines can churn out a baker’s dozen of burgers, all perfectly assembled with the appropriate condiments—pineapple rings for the man with the mustache, no mayo for the kid, extra pickles for the lady in white—in the time it takes a Per Se captain to plate an amuse bouche. I suspect that their muscle memory for slathering mayonnaise and laying on cheese runs so deep that their unborn children will feel it. 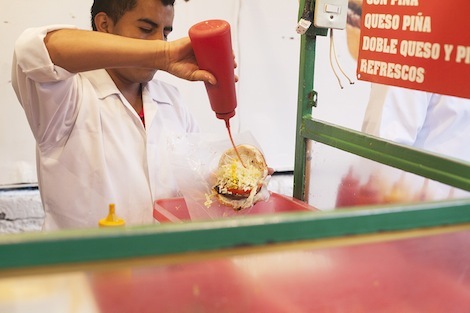 Most of these street stalls are without names, phones, or formal addresses, but one of the best is Hamburgesas a la Parrilla, in the Roma Norte neighborhood southwest of the city’s center. The cooks are at their best cooking for a crowd, when so much smoke pours from metal shack that you’d think Cheech and Chong were hiding inside. Their burgers are distinctly Mexican—thin rounds of highly seasoned beef, clapped with so much salt, smoke, and garlic powder that the patty tastes like a cross between a hamburger and a hot dog. They pile on the shredded lettuce, tomato, mayonnaise, mustard; hit it with a healthy squirt of ketchup; and instead of pickles, they use chopped, roasted, pickled jalapeños. 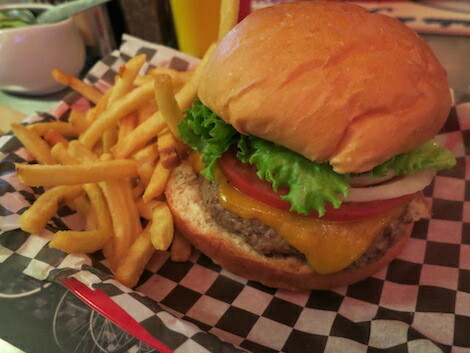 Cheese is melted to the bottom bun instead of the patty, which picks up a respectable char from the griddle. Wrapped in wax paper and handed to patrons on the street, the final product is best eaten right there in the smoke-filled haze. For some strange reason, the iconic American diner has captured the Mexican heart. There’s a number of American-style diners operating throughout the city, where you can find guys wearing little paper soda jerk hats serving classic burgers (90-130 pesos/$7-11), milkshakes in properly frosted glasses, and sides of fries. Places like Be Bop Diner, Candy Blue, and Barracuda Diner are such facsimiles of mid-20th century Americana, you almost expect Danny Zuko to slide across the black-and-white-checkered floor into the booth next to you. Be Bops Diner even has a classic convertible sitting in its foyer, a life-size statue of Elvis, and occasionally, live be-bop bands. Barracuda Diner, a long lunch counter with swiveling stools and turquoise booths, was one of the first places to serve an American-diner-style hamburger in Mexico City, and it’s most emblematic of the city’s love affair with diner nostalgia. The burgers are medium-thick patties seared on the flat-top, layered with tomato, onion, and pickles on a pleasantly squishy bun and served, of course, in a red plastic basket. They are a couple steps up from what comes from most American greasy spoons these days—the burgers are made from hormone-free beef and cooked to temp, plus there’s beer on tap. Like modernist tacos in NYC, the new-wave burgers of Mexico City are challenging everything locals have come to understand about the genre. Generally, these ambitious burgers are found in upscale neighborhoods where patrons are willing to pay at least $10 US a burger, and they have generated a diverse swath of burger craftsmanship. These fancier burger outposts offer inventive toppings—think deep-fried brie with grilled onions and cherry tomato salsa—as well as non-beef burgers, like lamb patties topped with shoestring fries and creamed spinach. Many are making their own buns, ketchups, and a parade of condiments that would make 5 Guys blush. 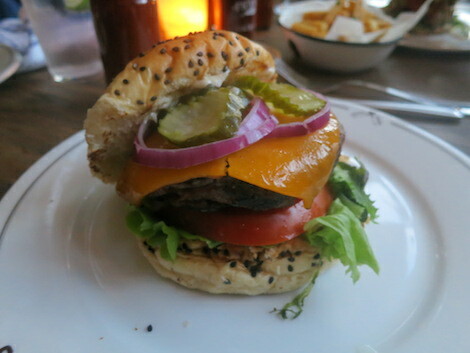 At La Burguesa, a charming space in Colonia Roma, for example, the kitchen dispatches its burgers with ketchup, Dijon, mayonnaise, pickles, tartar sauce, chopped pickled jalapeños, and salsa macha. 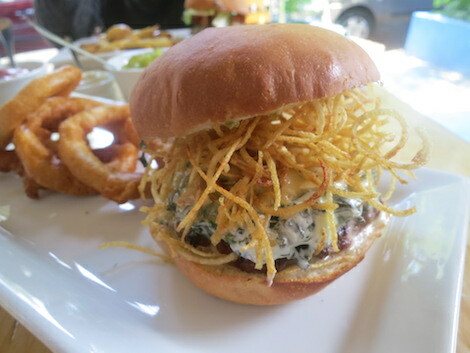 There are excellent sliders at Felix and the roving food truck El Buen Burgues, and even Mexico City’s most decorated chef, Enrique Olveras, has gotten into the burger game with Mr. Buns, an upscale burger joint where patrons can choose Wagyu grass-fed beef over plain old grain-fed. One of the front-runners of the artisan-patty boom is Butcher & Sons, which opened in 2012 and now includes three locations—including one that just opened in a stall in the fashionable Mercado Roma. The cooks here make four kinds of ketchup, douse their fries in truffle oil, offer a whole menu dedicated to the gin and tonic (another Mexican obsession), and serve a surprisingly good veggie burger. The burgers are named after musicians—the “Bowie” features roasted poblanos, guacamole, fried tortilla strips, bacon, and Swiss cheese, while the “Zappa” has foie gras and caramelized onions. 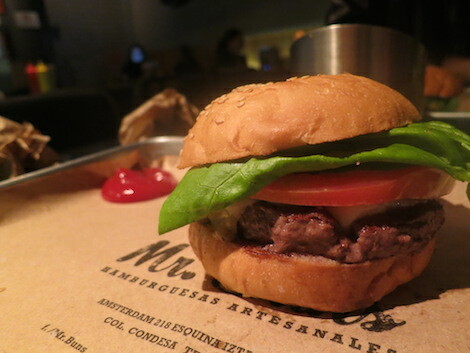 And the though the name is a bit doltish, WLB Condesa (“We Love Burgers”) may epitomize the craft-burger movement in Mexico. 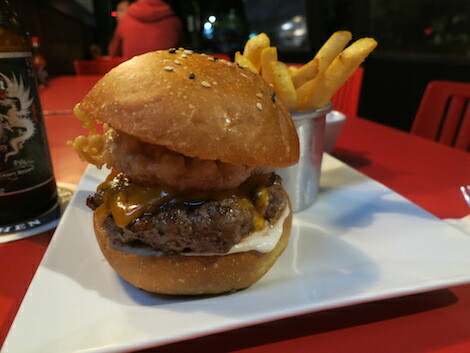 It serves one of the best burgers—an enormous puck of juicy, pleasantly crumbly, salty beef, cooked to a perfect medium-rare. The kitchen produces all of its own sauces—a thin ketchup, roasted serranos and onions, pickled jalapeños and carrots. The most popular creation is the “WLB,” slicked with BBQ sauce and topped with bacon and a fat fried onion ring; it’s served on crispy brioche that’s sturdy enough to hold the massive patty but squishes nicely under a firm grip. There are local craft beers. The fries— hot, crisp, and salty, with pillowy interiors and a little bit of skin left on—can be done “animal” style with melted cheese, caramelized onions, and bacon bits (a shout out to the West Coast’s cultish In N Out chain). And, as is the way with these things, there’s even burger that swaps out the buns with glazed doughnuts. 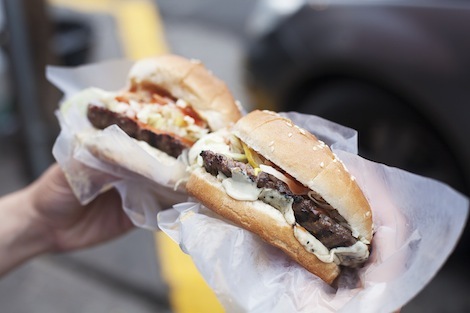 RELATED: Is Salt Lake City the Best Cheap Burger Town in America?